I was going to make banana bread. Something so jam-packed with bananas that all your taste buds would scream in excitement. Well, at the very least, the taste buds of my coworkers. You see, I’ve been getting a ton of demands requests for banana bread, which is actually totally fine with me, because I love the stuff. And, by love, I mean I would live in a house made of banana bread and eat a slice, or seven, with each meal. That’s not even a joke either. I’m one hundred percent serious. Oh, and don’t worry, there’s a spare room waiting for you in my banana house. You’re welcome. I had one little problem though: no bananas. So, I went to the market, walked right by the stand with bunches of perfectly ripe bananas, and placed two pints of raspberries in my cart. Wait, what? Yeah, you read that right. I left the market without a single banana. I’m not even that huge a fan of raspberries either. We have a rather neutral relationship with each other. Translation: I avoid them for the most part and they avoid me. It really works for us. And, yet, out of the nowhere I felt the need to put them into muffins.Why? Who knows. Who. Even. Knows. It could be because I’m really into muffins right now. Like, really, really really into them. I want one with every cup of coffee I drink. And, we all know how much coffee I consume. To clarify though, I restrain myself to only eating one a day. To further clarify, the muffins I’ve been eating are blueberry muffins made with Greek yogurt and honey. Yes, they are from Starbucks. And, no, I’m not getting compensated to promote them. 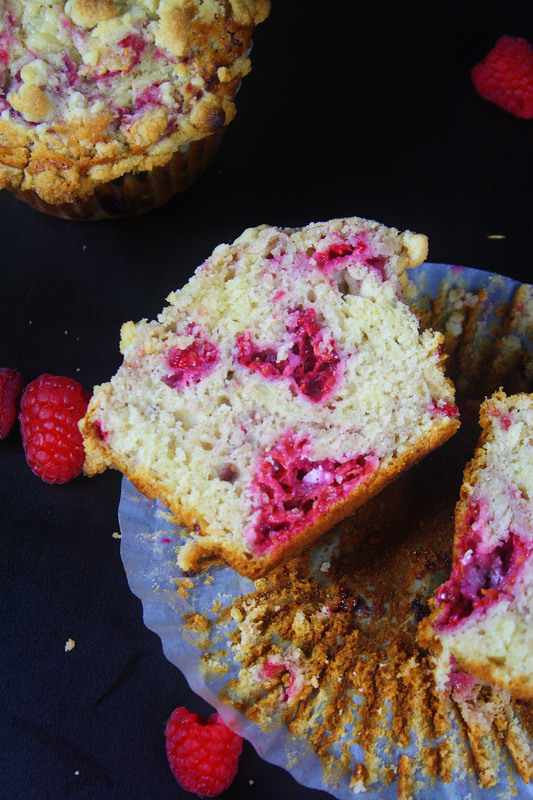 But, I made raspberry muffins. I can’t even with myself. I’m all about a bigger muffin too. Why? ‘cause I can pack more raspberries in them. ‘cause I can top them with more streusel. MORE STREUSEL. Oh so sugary and crumbly streusel. If I get to live in a banana bread house, then I want to vacation in a streusel house. Am I right? 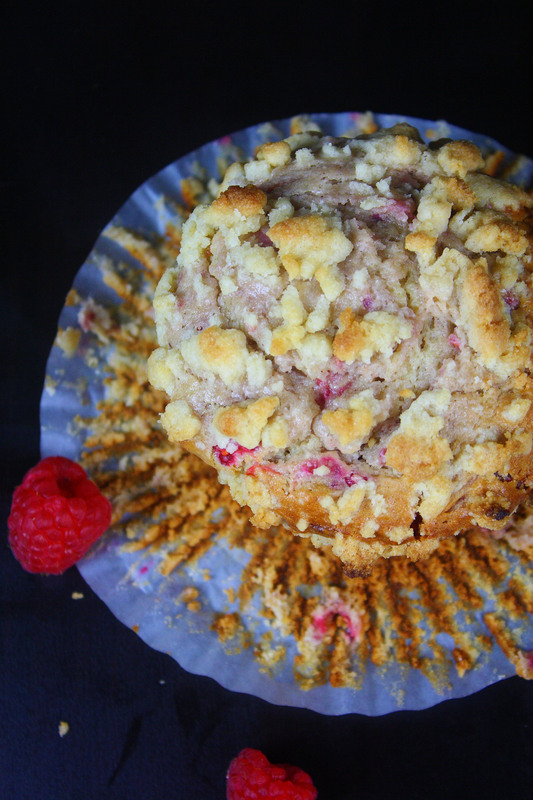 So, Jumbo Raspberry Streusel Muffins. 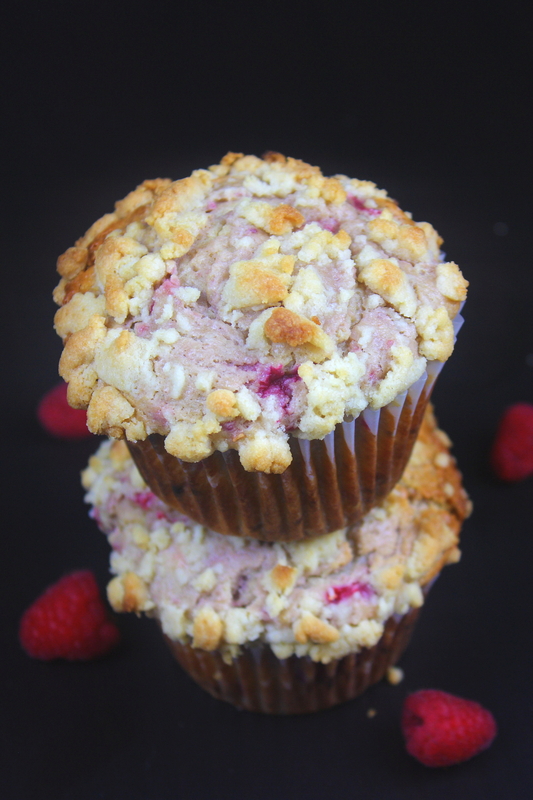 That means a large and in charge moist and fluffy muffin packed with raspberry flavor and topped with a sweet streusel crumble. 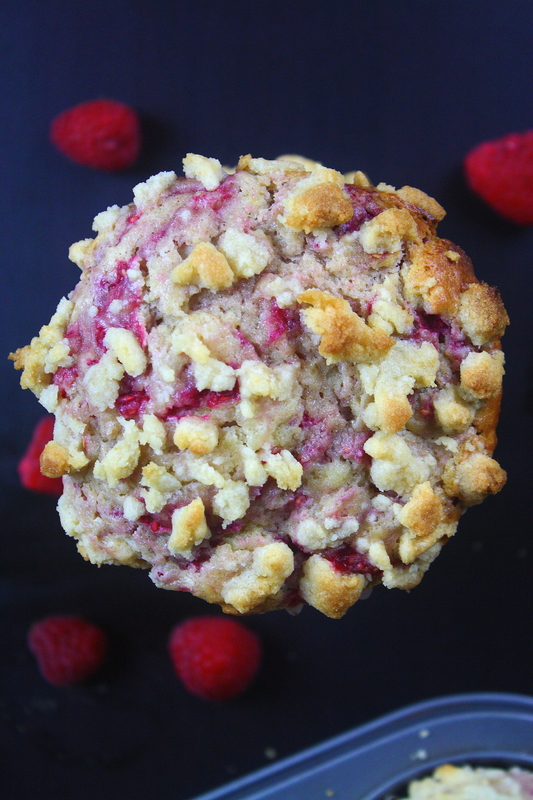 Take my advice, the next time you want banana or blueberry muffins, buy raspberries. In a small bowl whisk together sugars, cinnamon, and melted butter. Using a rubber spatula, stir in the flour. The streusel topping will be very thick, like a paste, and crumbly. Set aside. Preheat oven to 425 degrees and line a jumbo muffin pan with cupcake liners. Set aside. In a large bowl whisk flour, baking powder, salt, and cinnamon until combined. Set aside. In a medium-sized bowl combine egg, egg yolk, sugars, vanilla, and Greek yogurt. Add the butter, whisking until just incorporated. Fold wet ingredients into the dry ingredients until just mixed, the batter will be very thick and lumpy. Using a spatula, very gently, to avoid leakage of color, fold in the raspberries–don’t worry if some of the raspberries leak or break apart, it’ll still taste good! Divide batter evenly between the 6 cupcake liners, filling each to the very top. 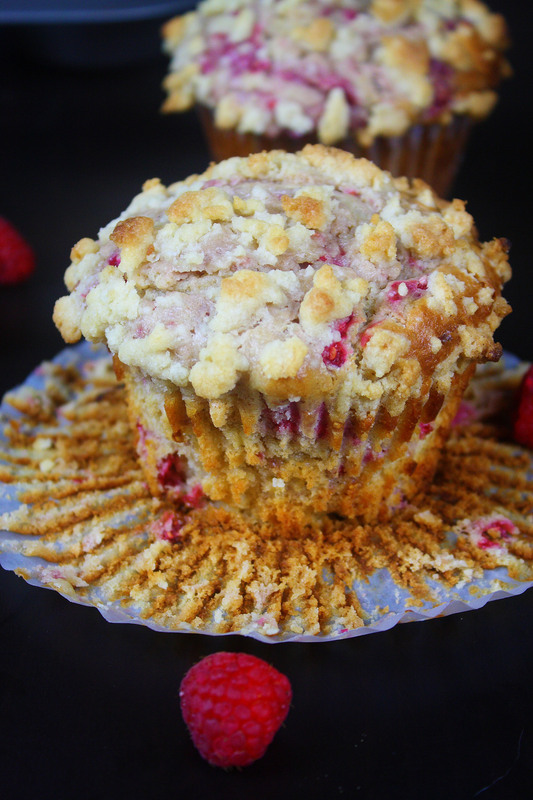 Sprinkle tops with streusel crumble. Bake muffins at 425 degrees for 5 minutes. Keeping the muffins in the oven, reduce the temperature to 350 degrees and bake for 25 more minutes or until tops are lightly golden and a toothpick inserted into the center comes out clean. If the streusel topping looks like it’s browning too quickly, loosely cover the pan with foil. 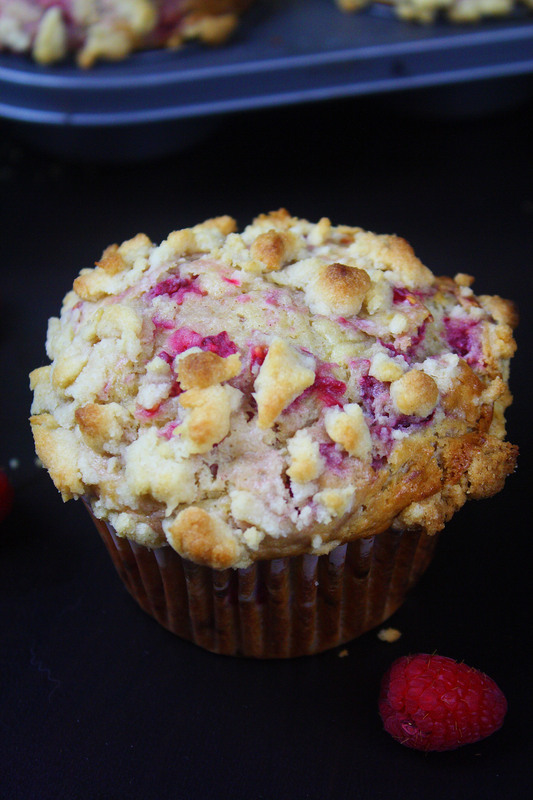 Allow muffins to cool slightly before digging in. *I’ve made this recipe twice now and the second time, I sprinkled my raspberries with 1/2 tablespoon of sugar before mixing them into the batter. There was more leakage of color, but I liked the added touch of sweetness it added to the muffin.